Ralph Dale Earnhardt, Jr. (born October 10, 1974 in Kannapolis, North Carolina), also known as "Dale", "Junior", "The Dominator", "Little E", "Junebug", or "Chuck" is a professional race car driver. He is the son of NASCAR legend Dale Earnhardt (1951-2001). 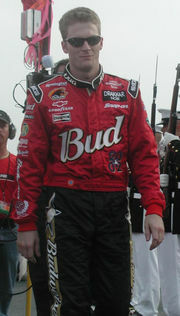 During his career, Earnhardt Jr. has competed successfully in a number of racing classes and events, and is a two-time Busch Series champion with 21 wins. 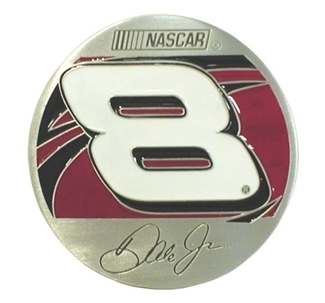 As of 2006, his primary role is driver of the #8 Budweiser Chevrolet Monte Carlo SS in NASCAR's NEXTEL Cup. Earnhardt, Jr. is also the team owner of JR Motorsports, and co-owner (with stepmother Theresa Earnhardt) of Chance 2 Motorsports. Chance 2 Motorsports is currently on a limited schedule.